Grease 9×9 pan, flour lightly. Mix together sugar, oil, egg; stir in milk. 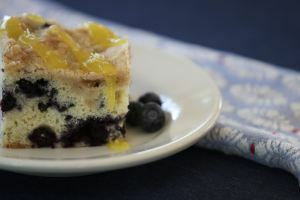 Mix together flour, baking powder and salt; stir into sugar mixture carefully fold in blueberries. Pour into pan. Mix together crumb mixture and sprinkle over batter. Bake 45-50 minutes at 350.